A new animated show from the people who brought you Beavis and Butthead and The Simpsons. 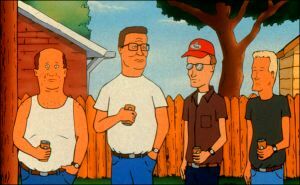 Bill, Hank, Dale, and the tongue-tied Boomhauer. Hank Hill is a potbellied, undershirt-wearing Everyman from Arlen, Texas. When he's not selling "propane and propane accessories," he spends time raising his son, Bobby, guzzling beer, and discussing auto maintenance with his friends, or chewing out his ditzy live-in niece, Luanne. King of the Hill is an animated peek into Hank's world -- one that offers a fresh, understated brand of humor. The brainchild of a match made in animated heaven, King of the Hill is a collaboration between Beavis and Butthead creator Mike Judge and Greg Daniels of The Simpsons. And while the strong influences of the two shows are easily apparent, King of the Hill has a feel that's all its own. The setting of King of the Hill plays a big part in setting the tone for the show. Life in Arlen moves slowly -- the show has a pace far slower than Simpsons and B&B fans are used to. And while King of the Hill takes its time setting up a plotline -- often going minutes without a laugh -- the payoff is a more mature brand of humor. While the hilarity of B&B and The Simpsons comes from a particular line or sight gag, King of the Hill will make you laugh by taking you into the mind of its characters and letting you sympathize with their bizarre situations. The cast of characters that orbit Hank's life is fairly simple, each one adding a new perspective on life and a different comic style. Hank's three best (well, only, actually) friends are a varied bunch, each one a different stereotype of southern life. Dale is a conspiracy buff who seems oblivious to the fact that his own son bares an uncanny resemblance to his wife's tall, barechested Indian-chief "friend" who always seems to be leaving (occasionally out the window) whenever Dale's arriving. Bill is a divorcee whose main contribution to the bunch seems to be providing a convenient fourth whenever a case of beer has to be split amongst them into six packs. The most entertaining of the group is the slanty-eyed Boomhauer, who regularly spouts off about the topic at hand in a voice that could easily be mistaken for a foreign language. After only a handfull of episodes, he's already covered such diverse topics as Seinfeld, baseball, and child rearing -- and he's even had a tete-a-tete with another incoherent favorite, Bob Dylan. Boomhauer's take on the Internet goes something like this (though it's just not the same without hearing his voice): "Yeah, man, I'll tell you what, that dang ol' Internet, man, you just go out on there, and point and click ... talking about ww dot w com and you got them that naked chicks on there, man, you go click, click, click, click, click, click, click, click -- it's real easy, man." Once Boomhauer goes into one of his spiels, Hank and company usually just (wisely) back off and give him some space to get it all out of his system. Hank and his wife Peggy (who he affectionately calls "peg-a-leg") spend most of their time raising 12-year-old Bobby, a confused Gen-X-er ("Mom, the Game Boy broke and I need to get on the Nintendo -- quick!") who wants to be just like Dad -- though he'd never admit it. Also living with the bunch is spandex-sporting niece Luanne, whose messiness and choice of attire (or lack thereof) push Uncle Hank to the edge. Visually, King of the Hill's animation resembles the B&B look, though it's drawn a bit smoother than co-creator Mike Judge's "other" show. The voices, provided by Judge and a host of others, are simply perfect. Hank himself is nearly identical in voice and appearance to B&B's Anderson, though his personality is distinct from his B&B twin. Fox apparently has high hopes for King of the Hill, putting it immediately following The Simpsons -- the only animated show other than The Flintstones to ever truly succeed in prime time. What will become of Hank Hill's blue-collar struggle remains to be seen, but in the meantime, King of the Hill succeeds in building off of a solid heritage of animated smashes, at the same time maintaining enough originality to keep viewers tuned in -- and laughing out loud.